Pictured, left to right: (front row) Harriet Mycroft, Bianca Patel, Aneeqa Abid, Xuefei Gao; (back row) Benjamin Ahn, Megan McCall (program coordinator), Joshua Mishkin, Abhi Nathan, Kendall Brothers, Supriya Jain, Abigail Robertson. It is not very often that a high school student has the opportunity to work in a lab or clinic shadowing a world-renowned researcher or doctor, but for the past six weeks, 10 Georgia high schoolers have done just that at Winship Cancer Institute. The Summer Scholars Research Program, now in its 16th year, exposes students to a multitude of experiences, such as learning about cancer research from Winship's top experts, lectures by doctors from a variety of specialties, and field trips to Grady Memorial Hospital and the Centers for Disease Control and Prevention. The students also have seen different parts of Emory's campus through visits to the School of Medicine's Medical Simulation Lab and the Woodruff Health Sciences Center Library. The Summer Scholars Research Program pairs each student with an oncologist with whom they complete their own research project and get an in-depth look at a specific cancer specialty. The program will culminate on July 14th with the students presenting their projects to an audience of their peers, mentors, and the Winship community. "Our goal with this program is to engage scholars at a young age and promote their interest in cancer research. I view this program as a critical part of my work and as a critical piece of Winship’s mission,” says hematologist Jonathon Cohen, MD, director of the program. The students attend weekly lectures with a wide array of speakers including oncologists, cancer survivors, and statisticians. Guest lecturer and 10-year cancer survivor Carolyn Higgins says, "It is wonderful to see such a fresh example of today’s future doctors." 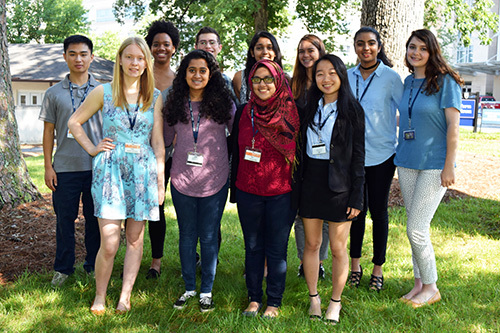 Cohen states: "The Summer Scholars Research Program is a unique opportunity for Winship researchers to interact with some of the brightest young people out there, many of whom we hope to consider as colleagues in the future."